The Orthodox presence in New Orleans dates to the middle of the 19th century, when Jewish arrivals from Eastern Europe began to settle in the city. They brought little with them, except for their traditional Orthodox practices and a determination to recreate their close-knit communities in a foreign land. Many of the arrivals to New Orleans settled in the Dryades Street neighborhood, six blocks of two story row houses stretching along Dryades from Howard to Jackson Avenue. Subsequent arrivals settled alongside friends and family from the old country, and the neighborhood quickly evolved into the nexus of the New Orleans Orthodox Jewish population. By the late 1800s, a visitor walking down Dryades Street would smell the aromas of Eastern European dishes wafting from the humble residences and would hear colorful Yiddish expressions exchanged outside the numerous Kosher delicatessens, butchers and bakeries. In 1858, the earliest arrivals from Poland and Prussia established an Orthodox congregation, named Tememe Derech, or “The Right Way.” The congregation soon became known as simply “the Polish Congregation.” As Jews from other Eastern Europeans regions began to arrive, they tended to congregate with their fellow countrymen, and establish services in accordance with local traditions. By the end of the 1800s, the Dryades Street neighborhood contained a number of small regional congregations, including the Galitzeaner congregation Chevra Thilim, a Litvak congregation Chevra Mikve Israel, and a Lithuanian Chasidic congregation named Anshe Sfard. These smaller congregations met in private homes and rented spaces and often had just enough attendees for a minyan, a quorum of ten members. Over time, the nuances of specific regional divisions gradually softened, and in 1904 a number of the small congregations, social aid organizations, and an early burial society merged with Tememe Derech, to create a single Orthodox Congregation, named Beth Israel. The new congregation commenced holding services in a building on the 500 block of Carondelet Street while raising funds for permanent synagogue. Members elected David Rosenson to serve as Beth Israel’s first president. Rosenson had immigrated from Russia in 1899 along with his wife and four children. Perhaps his experience moving halfway across the world with a family of six inspired his interest in luggage, for upon his arrival in New Orleans he established himself as a valise maker. By 1910, he owned a suitcase factory, which he managed along with his son Jacob. At the time of his presidency at Beth Israel, Rosenson lived near Beth Israel’s meeting space on Carondelet, but by the 1920s, after achieving success in manufacturing, Rosenson moved his family further uptown to a home on Josephine Street. After meeting in rented spaces, the congregation soon began raising funds to acquire a permanent place of worship. Although the Orthodox residents of the Dryades Street neighborhood generally maintained limited contact with the more socially established Reform Jews living a few blocks away along St. Charles Avenue, Beth Israel’s fundraising effort afforded an opportunity for cooperation between the groups. On January 13, 1905, Beth Israel President I.L. Haskel published an appeal to the whole Jewish community in the Jewish Ledger newspaper, stating: “The Orthodox Jewish community of our city is without a suitable place of worship … we appeal to Orthodox and Reform alike … wherefore we all should help us establish and Orthodox Synagogue worthy of its name and worthy of the generous community in which we live.” The Reform community responded generously, and later that year Beth Israel moved into a Spanish plantation home at 1616 Carondelet once owned by a former mayor of New Orleans, Joseph Shakespeare. A mere two years after signing the congregation’s charter, Beth Israel inaugurated the new synagogue in time for the 1906 High Holy Day services. In 1924, they tore down the house and built a beautiful new synagogue on the same site. After moving into the Carondelet Street synagogue, Beth Israel experienced rapid growth. By 1910, the Beth Israel congregation consisted of 180 families and was the second largest congregation in the city; it grew to 250 families by 1914. 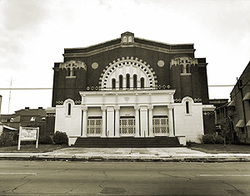 From this period through World War II, Beth Israel considered itself the largest Orthodox congregation in the South. During the early 1900s, the numerous small Orthodox groups consolidated into three congregations, all large enough to purchase permanent houses of worship. In addition to Beth Israel, the Galitzeaner synagogue Chevra Thilim built a small synagogue nearby at 826 Lafayette Street in 1915 and the Lithuanian Congregation Anshe Sfard purchased a small building in 1900 at 1309 South Rampart. These early decades of the 1900s marked a golden era for the Dryades Street neighborhood. Many of the new arrivals worked initially as peddlers, based out of dry good stores owned by more established neighbors. Their territories often included underserved parts of the town, including the poorer black neighborhoods. Others worked as butchers or in the New Orleans shipyards, or as tailors, coopers, clerks, laborers, bookkeepers and merchants. The members of the Orthodox community used their increasing economic success to support a broader range of congregational functions and reinforce a vibrant Jewish presence in the neighborhood. In 1915, Beth Israel congregants helped establish the “Talmud Torah” or “Communal” school at the corner of Clio and Josephine Streets. The daily afternoon Hebrew classes attracted members of both the Reform and the Orthodox Jewish communities. According to some accounts, in the 1920s, the Jewish population of Dryades Street reached an estimated 3,500 inhabitants. Beth Israel continued to grow through the 1930s, under the leadership of Rabbi Uri Miller. Membership expanded to approximately 350 families and the congregation added cemetery properties, founded a nursery school, and established a junior congregation. The same economic success that contributed to the vibrancy of the Dryades Street neighborhood ultimately precipitated its demise, as the children of the East European immigrants gradually moved uptown, into the Lakeview area, and to neighboring suburbs. Following World War II, the three Orthodox congregations all suffered from reduced membership as more and more of their congregants left the neighborhood. 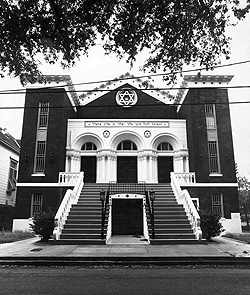 In 1948, Chevra Thilim build a new synagogue further uptown, at the corner of South Claiborne and Jena Streets, a move that encouraged increasing numbers of Jewish families to make the move uptown. In 1963, Beth Israel purchased a property in the Lakeview neighborhood, at 7000 Canal Boulevard. Congregants celebrated the new building’s formal dedication in 1971. Anshe Sfard remains the only Orthodox congregation still operating in the Dryades Street neighborhood, albeit with a significantly diminished membership and range of communal functions. Although the court ruled in favor of allowing mixed-seating within the Orthodox congregation, the issue remained far from settled among congregants. Following the case, the congregation split. The members advocating mixed seating ultimately left Chevra Thilim, and founded New Orleans’ first Conservative congregation, Tikvat Shalom. Soon after the case, the question of mixed seating in Orthodox congregations evaporated as separate seating emerged as a definitive and necessary element of Orthodox prayer services. Following the case, Chevra Thilim remained Orthodox and preserved separate seating, but continued to lose members as families moved away from the neighborhood. Chevra Thilim eventually did adopt mixed seating, but still could not stave off the membership attrition. In 1999, the two congregations reunited and formed Shir Chadash, a Conservative congregation with traditional leanings. Today, Shir Chadash, Beth Israel, and Anshe Sfard continue to serve more traditionally minded New Orleans Jews, along with two different Chabad Houses. Hurricane Katrina flooded Beth Israel’s synagogue in Lakeview, destroying its Torah Scrolls and most other religious artifacts. Rising above this devastation, Beth Israel has begun to meet in the chapel at the Reform Gates of Prayer congregation in Metairie. They have acquired a home in the area to be used by their new rabbi Uri Topolowsky and are working to build a new synagogue. Orthodox Judaism in New Orleans has often been overshadowed by the larger Uptown Reform Temples. Maintaining traditional practice in a city known for its treyf seafood and carefree attitude has often been a challenge, but these traditional congregations continue to persevere.